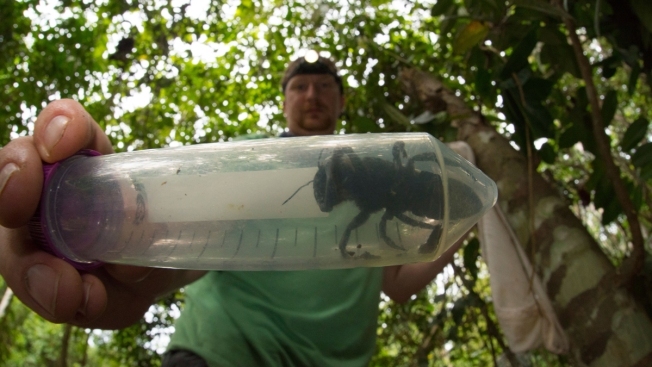 "Amid such a well-documented global decline in insect diversity, it's wonderful to discover that this iconic species is still hanging on"
This undated handout picture provided by Global Wildlife Conservation on February 21, 2019, shows entomologist and bee expert Eli Wyman with the first rediscovered individual of Wallaces giant bee (Megachile pluto) in the Indonesian islands of the North Moluccas. The world’s largest bee, last seen by a scientist in 1981, is not extinct after all, NBC News reported. A single female was found and documented earlier this year on an Indonesian island, an Australian university and other groups said Thursday. The bee, Megachile pluto, also known as "Wallace's giant bee" — named after British naturalist Alfred Russel Wallace who discovered it — was seen in January in Indonesia's North Moluccas island group by an international team of researchers looking for the rare species, the University of Sydney said. "Amid such a well-documented global decline in insect diversity, it's wonderful to discover that this iconic species is still hanging on," team member Simon Robson, honorary professor of the university’s school of life and environmental sciences, said in a statement released by the educational institution.